Albergue Gran Canaria, Gran Canaria, Hiszpania : Rezerwuj teraz! Albergue Gran Canaria is a cozy and functional hostel that will bring good vibes to the backpackers and travellers. We capitalize our knowledge and experience of the city and the hospitality sector to bring the best possible experience to our clients. 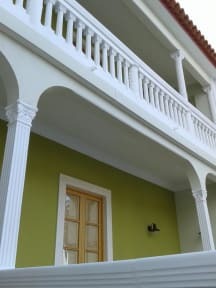 The hostel is situated in a old colonial style house, who has been completely renovated and adapted to the needs of the backpacker of the 21st century. This without losing the authenticity of the house. Albergue Gran Canaria is located in the barrio of Pino Apolinario, this hostel is only 10 minutes away with car of bus from the old city centre of Triana and Vegueta in Las Palmas. In this sense, some of the finest attractions of our city are near to our facilities, landmarks such as Casa-Museo Pérez Galdós, Plaza de Santo Domingo and the Catedral de Santa Ana, amongst other relevant spots that can be reached from our facilities easily. We are fully oriented to offer budget and quality accommodation to backpackers and travellers. For these reason we are fully oriented to offer different dorms with diverse capacity. All of them with all the necessary services and amenities to guarantee the travellers a great stay. 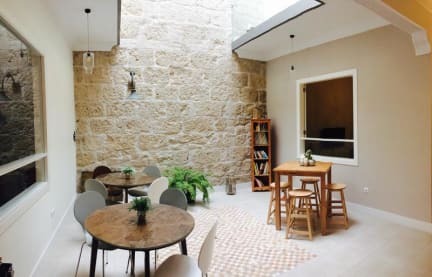 In addition, we have several common areas in which the guests can enjoy our facilities, get together and exchange past experiences and future plans. After the 23.00 if there is a late check in, an extra fee will be charged. For those who book one day or two days before the check in time, they can cancel their booking with no penalty if they cancel the booking within a limit of time of four hours after the booking.